To accomplish the goals of this demonstration project, fifteen monitoring sites were selected in four different states (IA, IL, IN, and MN). A variety of site characteristics, not all considered "ideal", were chosen to demonstrate the effectiveness of the practice if implemented at a large scale. This also afforded the opportunity to explore why some sites had SB systems that were more effective at removing nutrients than others. Water flow rates from the subsurface drainage systems were monitored, and water samples for nitrate and phosphorous analysis were taken from September 2012 through September 2015. 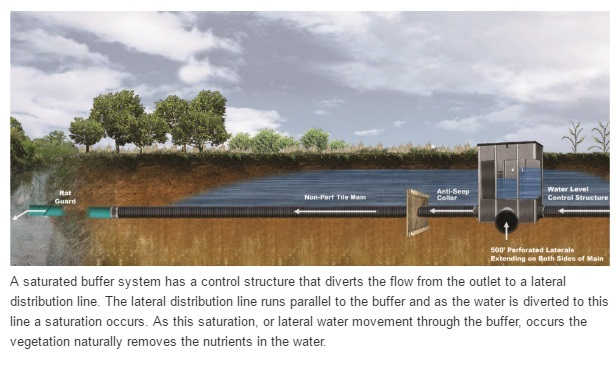 The data from this study confirm that, when proper site conditions and design considerations are met, the SB practice can be an effective method for reducing nitrate transport from subsurface drainage systems. Phosphorus loads, however, appear to be generally unaffected by this practice. Furthermore, using the ultra conservative estimates for the cost of installation for the sites that proved effective in removing nitrate, assuming a 50 year effective lifespan for these installations, and a 4% inflation rate or cost of money, the costs ranged from $0.55 to $4.64/lbs-N with an average of $2.13/lbs-N removed. This compares to $1.38/lbs -N for denitrification bioreactors, $5.06/lbs - N for nitrate removal wetlands and $3.21/lbs - N for rye cover crops (tile drained acres). (Source: IL Nutrient Loss Reduction Strategy). Thus, given the conservative cost estimates derived in this study, the effective saturated buffers had a cost range similar to these other field edge practices and much less than fall-planted cover crops. In addition, the practice takes no more land out of production than already used for the riparian buffer. � Get in the channel and walk the section of ditch/stream where the proposed saturated buffer will go, preferably when the water level is at base flow or lower. Look for and mark all outlets. � Verify the tile system you are intercepting has a large enough drainage area to justify the cost of installing a saturated buffer treatment system. � In addition to using soil maps, take soil cores to verify high organic matter and lack of coarse materials within the buffer. � Sites with shallow ditches that are frequently flooded may not produce satisfactory results.